Freely translated by Anoosha Boralessa in April 2015; not reviewed by bilaterals.org or any other organization or person. The heads of the two main Francophone Belgian unions express their clear reservation on the Transatlantic Trade and Investment Partnership. This is the opinion of Marie – Helene Ska (Secretary- General of CSC) and Marc Goblet (General Secretary of FGTB). Whereas in both Germany and Austria passionate debates are being held on the relevance of the Transatlantic Trade and Investment Partnership , public opinion in our country is starting to understand that since 2013, the EU Commission has been negotiating a trade and investment agreement where fundamental issues are at stake. The TTIP is not a classic trade and investment agreement similar to those the European Union had concluded almost in continual fire during recent years. 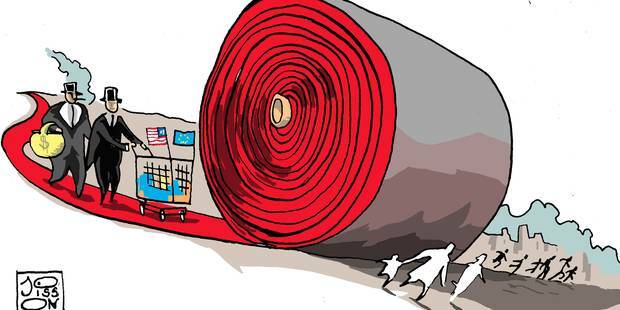 The TTIP is not really about lowering customs and opening new markets. In fact the transatlantic market, apart from public markets and agricultural products, has already been largely liberalized. What the negotiations are hoping for above all is to increase productivity by decreasing non-tariff barriers. This affects, for example, pre-marketing tests for medicines or cosmetic products, sanitary or phyto-sanitary regulation or the need to comply with regulations for cars, machines or consumer products. Officially, the European Union and the US aim at concluding an agreement on the basis of rules that strongly favor businesses (the “Golden Standard”) in a number of areas. Their objective is to establish a global standard capable of resisting any effort by China to establish rules that would be to its advantage. However, by speeding up their mutual trade through harmonizing their legislation, the European Union and the United States are also going to increase competition, through multinationals, of their social regulations and tax regulations (which have still not been harmonized at the European level, and will hardly be more harmonized at the transatlantic level). In order to pacify European public opinion, the Commission put forward the alleged advantages of this agreement. It also commissioned an impact study suggesting very optimistic hypotheses on the drastic reduction of non-tariff barriers. This study forecasts a supplemental 10 year growth of 0.5% which represents 0.05% growth per year. This is in fact statistically negligible. The Commission Study also considers any type of regulation as a cost. The researchers have not taken into account that some regulations generate ecological and social benefits. On the basis of this impact study, the Commission communicated that the TTIP could generate an average gain of 545 euros for each European family. But in this calculus, profits forecast for multinationals were immediately expressed by an increase in the income of an average family! Through the intermediary of the former Commissioner for Trade, Karel de Gucht, the European Commission very widely communicated that the TTIP would lead to 0.5 % growth and led people to believe that was an expression of annual growth. An impact study on the basis of the UN econometric model comes to contradict the figures produced by the Commission. According to this study, the TTIP would lead to a reduction of net exports, a reduction in GDP, a loss of 600,000 European jobs and a risk of the European market disintegrating, particularly for countries such as Germany, France, the United Kingdom and the Scandinavian countries. This impact study confirms what trade unions and civil society organizations have feared for a long time: a willingness to stimulate growth by once again targeting EU exports is not the miracle solution for the crisis. Is it not worrying to observe that the largest consumer market in the world prefers to capture parts of international markets, while it suffers above all a sluggish internal demand? This is what Mario Draghi was forced to reluctantly admit. The TTIP also raises some other concerns. Put under pressure by civil society, the European Commission time and time again promised that public functions would not be affected. However health care and adult education were re-instated on the list of services to be liberalized. In addition, the enhanced competition between the EU and the US to attract investors is going to increase the potential for fiscal dumping, to reinforce pressure for austerity policies and to make it even more complicated to get the necessary financial means to develop quality public services. And what should we say about the Investor State Dispute Resolution Mechanism (ISDS)! European public opinion, as expressed through public consultation, held negative views on this mechanism. So why does the European Commission exert a lot of pressure today on member states by referring to a similar agreement with Canada (CETA)? It is thanks to this mechanism that US businesses could challenge our regulations and states before a tribunal if they consider that they have been unfairly discriminated against. Finally, does the Commission consider that it can still obtain guarantees in terms of improvements to labor laws in the United States? The US has not ratified a number of fundamental ILO conventions. Very specifically, trade union freedom is flouted on a daily basis. Workers that want to start up a trade union are invariably dismissed. The weakness of collective rights is a direct cause of stagnation of wages and growing inequality in the United States. The OECD and the IMF consider such inequalities as one of the fundamental causes of the global decline in economic growth. Trade unions consider that it is clear that the TTIP will not generate any improvement in labor law in the United States. Its added value is therefore zero. Must we therefore open the door even further to social dumping? Must we applaud closer trade with a prosperous country that is totally liberalized where the minimum wage is 25% less than ours? For trade unions and civil society it is clear. We really do not need the TTIP! A petition, not recognized by the European Commission, “Stop TTIP” has received more than 700, 000 signatures in Germany and a total of 1,340,000 signatures from EU states. These include Conventions 87 and Convention 98 which relate to the freedom of association and the right to collective bargaining.